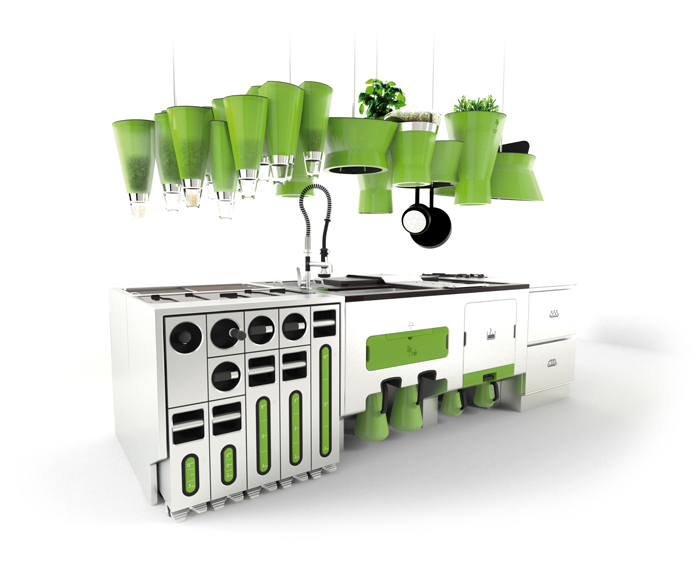 Let’s start with an ecologically friendly kitchen called appropriately enough – “ecokook.” This complicated, standalone kitchen is a self sustaining workspace, with efficiency at the heart of each design decision. The left side is all about processing waste efficiently. Wow. Solid waste to the far left, with hand cranked components for can and plastic crushing and bottle breaking. Paper is shredded and bricked. In the middle area, solid organic waste is processed by… wait for it… earthworms! This produces fertilizer for the herbs above. Liquid wastes can be processed and routed to water plants, or sent to the sewer system. Kitchen storage space comes next, followed by horizontal refrigeration sections. The weirdest looking part is definitely the overhead area. 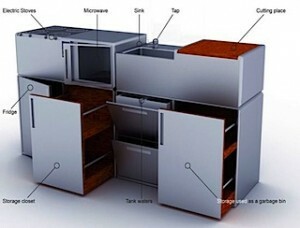 Compact and fully featured, the the Kit–Cub Kitchen is both free standing unit designed in modular fashion. The cube shaped, standalone island-style compact kitchen unit comes with a small refrigerator, storage cabinets, garbage bin, microwave, sink, cutting table and an electrical cooking surface. Beneath the sink, there are two water tanks, one of which feeds the sink and the other collects the used water. 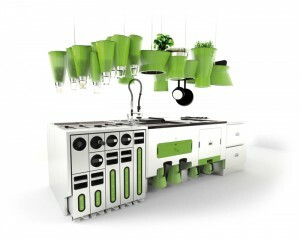 This kitchen is the brainchild of Paul Mauduit. Let us briefly mention a green technology that is also catching on these days – magnetic induction ranges. That’s right these high-tech replacements for gas and electric ranges greatly reduce the carbon footprint used in kitchens. That’s because they are far more efficient at heating food. Magnetic Induction systems use electricity to create magnetic fields that heat up the cookware – not the cooking surface. The molecules in the cookware are excited and heat up, thus heating the food contained within. It’s a much more effective and efficient way to get your food hot than the old system of heating up the cooking surface which heats up the cookware which heats up the food.